Having a saddle that does not properly fit can turn a pleasant horse into a bucking bronc. A saddle should fit so that the panels properly distribute the rider’s weight across the horse’s back. Because variations in individual horses' back musculature cause saddles to fit differently on every horse, you can change saddle fit by changing the shape and fill of the saddle's panels. Consider whether foam or wool panels are most appropriate. The panel of the saddle is the area beneath the seat that rests against the horse’s back. 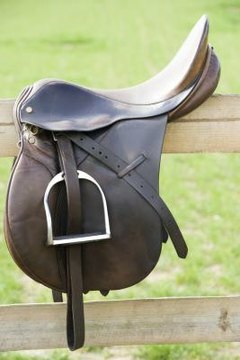 The panels of the saddle should have equal contact maintained between the panel and the horse’s back across all points so that the rider's weight is evenly distributed. If the panels fit incorrectly, the horse can become back sore or develop painful rubs. Most saddles are made with universal panels so they fit a wide range of horses. If a horse has an abnormal anatomy, a saddle maker can customize panels to accommodate for differences between horses, such as the shape of the wither or shoulder size. One of the innovations in saddles is the development of foam panels. Closed-cell memory foam is injection-molded into a predetermined shape to form the panel. The foam is pliable in nature and is able to adapt to the shape of the horse as the rider’s weight presses on the foam. These panels return to their original shape after each use. To adjust a foam panel, unlike a wool one, you'll have to replace the entire panel. A saddle flocked with wool will have leather panels gusseted along the edges of the saddle. A saddle maker will stuff the flocking into the panels to create a firm but springy panel. It is essential that the wool used in the panels be high-quality so the wool remains smooth inside the panel without clumping. Over time, a wool-flocked saddle will mold to the shape of a specific horse, creating an almost custom fit. If the shape of the panels needs to be changed, or if the wool starts to clump over time, a saddle maker can open the gussets and re-flock the saddle with new wool. Although wool flocking has been the traditional fill for many years, most of the high-end saddle manufacturers have moved toward foam panels. The foam panels offer a versatile fit and are a suitable choice for riders who may ride multiple horses or have a horse that might change in musculature. The primary disadvantage of foam is that adjustment or replacement of foam panels can be expensive. Most saddles are still available with wool panels, which may be best suited for riders who use the saddle only on one horse, since the saddle will mold to the shape of the back and might not fit multiple horses. However, in the event that a wool panel needs to be adjusted, either from wear or for shape, reflocking the panels is an inexpensive and quick fix.